10 • June 2018 • S I G N & D I G I T A L G R A P H I C S Canon and Memjet Sign Cross-Licensing Agreement San Diego-based inkjet technology company Memjet announces that it and Tokyo-based Canon have entered into a long-term, global agreement to cross-license their patents "around key segments and applications." 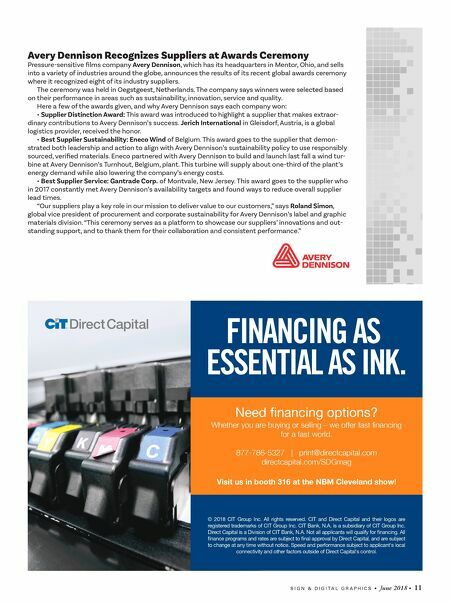 Memjet's original technology platform is the VersaPass, an aqueous, dye-based, single-pass digital print system that enables on-demand printing in a variety of markets, including desktop labeling, mailing and addressing, wide format and commercial press. It later added its DuraLink digital printing platform, which expands Memjet's technology to a broader range of commercial, packaging and industrial printing markets The companies were not more specific about which patents would be cross-licensed, and finan- cial terms of the arrangement were not disclosed. Canadian FASTSIGNS Franchise Lends Assistance to Local Hospice FASTSIGNS of Newmarket in Ontario, Canada, recently lent its hand to a local hospice, the Margaret Bahen Hospice, also located in Newmarket. According to the company's Daniel Patania, FASTSIGNS produced three "selfie frames" for the hospice at a discounted cost, and then donated a 3´ x 6´ full-color, one-sided banner that the nonprofit could use for its "Hike for Hospice" event. Patania says the material used for the selfie frames was 3/16 foam core, with centers cut out, and 3M ij35 vinyl. The banner material was 13-ounce gloss. The printer was an Epson SureColor S60600. "We're more than just a sign company," Patania says. "We're experts at help- ing companies tell their story." Stratacache Announces Acquisition of X20 Media from Barco Dayton, Ohio-based Stratacache, a digital signage and content distribution solutions provider, announces its acquisition of Montreal-based X2O Media from Barco. Since 2014, X2O has been part of Barco's Enterprise division, which focuses on solutions for meeting and control rooms. Over the years, X2O has acquired some major clients, including John Deere, Verizon, Fox News and Accenture. Stratacache says all X2O's customers will continue to be managed by that company, which employs about 45 people, and it will continue to operate from Montreal. "With the acquisition of X2O Media, we will expand our portfolio with a complete solution for dynamic content display based on real-time data, plus add great new tools in the e-learning and broadcast markets," says Chris Riegel, CEO of the Stratacache family of digital media/marketing technology companies. HP Announces PrintOS Marketplace Solutions Store At its recent Dscoop Dallas 2018 conference, HP introduced the PrintOS Marketplace, a new solutions company for the HP PrintOS cloud-based print production operating system. The company says the Marketplace is designed to help spread knowledge and tools for HP digital printing among HP print service providers. It will offer production and design tools and services from both HP and third parties, it says. Opening this summer, Marketplace welcomes any vendor to offer subscription-based apps for PrintOS members that help HP customers automate production, expand offerings and grow business. Currently, PrintOS has 5,400 print service providers that are subscribers, including owners of HP Indigo, HP PageWide Industrial and HP Scitex presses. PrintOS helps PSPs simplify and automate print produc- tion processes and grow their digital business. OneFlow Systems and HYBRID Software are the first two partners enrolled in the PrintOS Marketplace. Pre-release versions of their value-added solutions were demoed in the HP Dscoop showcase.